THE STORY - Famous symbologist Robert Langdon (Tom Hanks) follows a trail of clues tied to Dante, the great medieval poet. When Langdon wakes up in an Italian hospital with amnesia, he teams up with Sienna Brooks (Felicity Jones), a doctor he hopes will help him recover his memories. Together, they race across Europe and against the clock to stop a madman (Ben Foster) from unleashing a virus that could wipe out half of the world's population. THE BAD - Literally everything else falls completely flat as Ron Howard seems uninterested in making this third adaptation of Dan Brown's novels exciting in any way possible. Ten years ago, Ron Howard and Tom Hanks teamed up to bring Dan Brown's controversial novel "The DaVinci Code" to the big screen and the results were equally controversial. The film was a box office success but was mauled by critics for being implausible and completely ridiculous. Three years later, the sequel "Angels & Demons" was released to slightly better but still not fantastic reviews and worse box office success than its predecessor. And now here we are six years later with the third movie in the Robert Langdon series called "Inferno." How do the results stack up? Well let's put it this way: there is the fourth novel by Dan Brown starring Robert Langdon called "The Lost Symbol" with another novel forthcoming called "Origin." And based on the experience I had watching "Inferno" and the other films in the series, I hope that those other two adaptations don't get made. The famous professor of symbols, Robert Langdon (Tom Hanks) is back as he wakes up in a hospital suffering from a head wound and is experiencing amnesia and can't remember events from the past. Doctor Sienna Brooks (Felicity Jones) gets caught up in his predicament when an assassin enters the hospital with the intent of trying to kill Robert Langdon. Now on the run, accused of being fugitives and with many trying to hunt them down including the head of the SRS team, Christoph Bouchard (Omar Sy), Langdon and Brooks must race against time to stop a mad billionaire (Ben Foster) from unleashing a virus that has the potential to wipe out a large portion of the Earth's population. 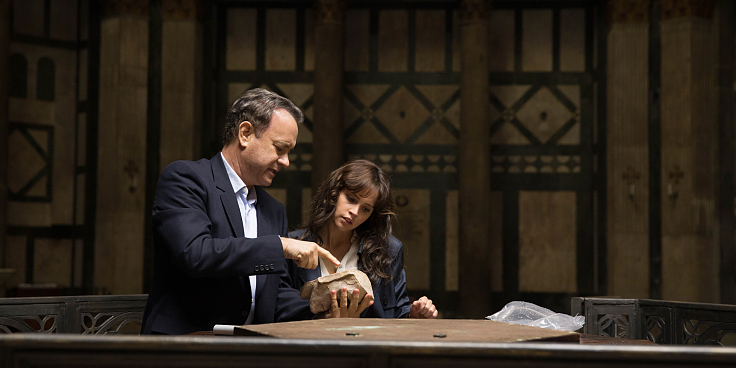 The plot for "Inferno" tries to put a new spin on things within the series by having Langdon suffer from amnesia due to his injuries at the start of the film and the results are not only disorienting but also incoherent. I understand that Ron Howard wants us to feel just as confused as Langdon, but this is supposed to be a mainstream thriller, not "Memento." As a chase film, it might simply be the most boring chase movie of the year with a ridiculous plot line that we not only never get invested in but also can't buy into due to its implausibility. The final plot twist alone had audience members laughing at how utterly insane it was. And speaking of insane, the villain's major plan to save humanity by wiping out a large chunk of humanity has been explored in countless other films before that it lacks originality and is presented in such an unexciting manner that I was more unengaged by this installment in the franchise than the other two. The acting from Tom Hanks is fine because...well, he's Tom friggin' Hanks. Felicity Jones fairs much worse as she's given some of the worst dialogue and can't seem to say the lines without garnering a nervous laugh or cringe from the audience. Everyone else in the film might as well have signs on them that say, "we did it for the paycheck" as there is zero effort from anyone in the cast to make their characters memorable or relevant. Which brings me to director Ron Howard. Forget the fact that he is saddled with a terrible screenplay from David Koepp. Forget that his previous efforts with the series were not that good to begin with. He somehow manages to reach another new low with "Inferno" as his unimpressive and shallow direction does not lead to a single moment of excitement or wonderment. This is a story about a man who looks towards ancient artifacts within historic locals for answers to a mystery he is trying to solve against a ticking time clock. It should be fascinating but instead is a snoozefest of the highest order. Even Hans Zimmer, who is traditionally excellent in every project he is associated with, provides an electronic rehashing of his original score from the series that does not carve out its own identity for itself. With other potential novels to adapt, I'm finally drawing the line with "Inferno" and declaring this series dead. I liked aspects of "The DaVinci Code" despite its flaws. I found "Angels & Demons" to be more bearable but still not particularly great. Now, with "Inferno," my patience for this series to reach a creative peak has expired. It's clear that Ron Howard and Tom Hanks keep on re-teaming up for these films when it suits them financially to do so as there is not a single ounce of effort put into making them as fascinating and exciting as their book counterparts continue to be. Cast this one in the inferno and be done with it.